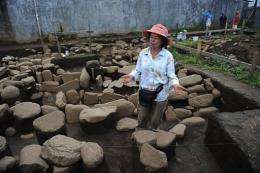 Costa Rican archaeologist Maritza Gutierrez works on tombs made with stones at an indigenous cemetery found in the town of Tres Rios, outskirts of San Jose. An 800-year-old, pre-Columbian burial ground with baskets full of human remains was unearthed at a building site outside San Jose, National Museum archaeologists said Tuesday. An 800-year-old, pre-Columbian burial ground with baskets full of human remains was unearthed at a building site outside San Jose, National Museum archaeologists said Tuesday. "It's a funeral complex made from river stones and slabs," Maritza Gutierrez, who heads the digs at the Tres Rios district 10 kilometers (six miles) from the capital, told reporters. The burial ground, dating from about the year 1200, yielded 26 sets of human bones from children to adults, contained in baskets made of plant fiber, an unusual material for native groups predating the discovery of the New World by Christopher Columbus. Archaeologists also found 98 artifacts made of stone and ceramics, Gutierrez said. It was too early to determine exactly to which indigenous group the remains belong, she said, adding that before the 1500s about eight different ethnic groups lived in what is now Costa Rica. Gutierrez said the burial site was first discovered two months ago by workers digging foundations for a new house, but was kept from the public while archaeologists completed their excavations. It lies in an empty lot surrounded by residential homes. National Museum director Patricia Fumero said the archeological find was "very important," when added to two other pre-Columbian burial grounds found last year in Costa Rica's jungles and mountains, from 1,200 and 1,700 years ago.